Dining at Metrogusto is a satisfying experience, from the warm, personal welcome at the door through the delicious high quality Italian dishes right through to their sensational puddings. 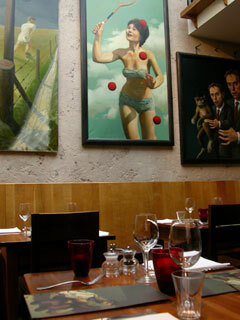 The dining room is large, with an atmospheric artistic style. The walls are adorned with interesting and beautiful original paintings giving the whole place an air of glamour and elegance. Metrogusto serves a variety of popular Italian dishes and some inventive combinations of Italian food. They have been awarded a Michelin Bib Gourmand Award for good value for money and have received favourable reviews from Harden’s, Time Out, the Sunday Times and The Evening Standard amongst others. Metrogusto�s elegance and the ease with which it impresses its customers, makes it an ideal place for almost any occasion, be it a business meeting, a romantic evening or a family celebration. Babies and children welcome as high chairs are available. There is a separate function room, which can cater for parties of around 24, with the combined restaurant accommodating of up to 60 guests. Metrogusto's menu is well -executed and rather interesting. The Chef here is very innovative and you will find some interesting and tasty combinations. Be sure to try their superb array of puddings and there is a great selection of excellent wines. The Hardens Food Guide 2006.